Wickerworking is one of the most ancient crafts of the Rus. This craft used to be of great importance as could response to the necessities of everyday life of many generations. From old manuscripts we know that willow furniture was also known in the Ancient Rome. A willow bed dated back to II century AD is exhibited in Treve* museum. Nowadays there is a wide range of willow goods - these are various forms and constructions of the furniture, baskets, lampshades, flower stands, etc. Wicker furniture has an enviable reputation of cottage furniture. Though some new-designed models ruin this stereotype. Alongside with classical Vienna chairs and rocking chairs, stools, tables, sofas, armchairs and other wicker pieces of furniture for bars, cafes and offices are produced. Our recent years' experience proves that owners of outdoor cafes and restaurants would rather buy a wicker furniture than a plastic one, though the latter is cheaper. The reason is that wicker furniture is durable, light and aesthetically acceptable. Willow may be well combined with glass. Natural willow's colour is wooden - light-yellow proceeded by yellow that gives furniture original and unique beauty. Wicker furniture is very durable. It's due to the way the furniture is produced. It's not made of several separate elements but it's bent with the joints fixed with the willow rods. 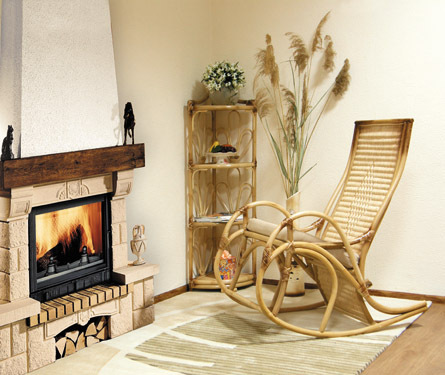 With the help of the wicker furniture it is rather simple to create a style of the room. Even if you buy pieces from different sets the furniture in the office won't look heterogeneous. Softness of lines and comfort are distinguished features of the wicker furniture. No matter what pease of furniture it is: bookcases, bookstands, desks, arm-chairs, etc. You don't need professional interior designer to furnish a hotel room or an office. Willow itself becomes leitmotif of the design, it adorns and decorates any interior. Chernihiv factory of willow furniture was founded in 1925 and is one of the oldest enterprises on the territory of the former USSR. This is the only Ukrainian enterprise included in the European catalogue of willow furniture manufacturers.